Granted, these are not gluten free... so when I enjoy them, I use my supplement to help with the gluten symptoms I get. But one day, I hope, there will be a gluten free version of phyllo dough! These are fantastic for the holidays and you can make these in advance then freeze. To cook from frozen, just remove and bake in a 375 degree oven for 30-40 minutes, or until the middles are warmed through and they are golden brown. No need to defrost! This was another fantastic recipe made with my favorite butter - Plugra. A special thanks to Plugra for providing me with butter to use this recipe! In a large bowl, combine the spinach, chicken, feta, mozzarella, eggs, salt and pepper together to create the filling. Set aside. In another small bowl, combine the melted butter and oil. Place one sheet of phyllo dough on a flat work surface with the long end in front of you. Brush with the phyllo with the butter and oil mixture using a pastry brush. Working quickly, place another sheet of phyllo dough on top of the first and brush with more butter and oil mixture. Layer 2 more phyllo pieces [4 pieces total] on top of each other this way, brushing butter and oil on each layer. Cut the sheets of phyllo in half lengthwise. 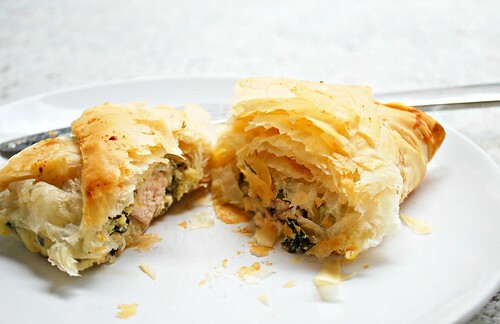 Place ¼ cup of the chicken and spinach mixture on the shorter end and roll the phyllo up diagonally as if folding a flag. Fold first diagonally and then straight until you reach the end of the sheet. The filling should be totally enclosed. Continue assembling phyllo layers and folding the filling until all of the filling is used. Place spanakopita on the prepared baking sheet, seam side down. Brush the tops of each spanakopita with the butter and oil mixture and bake for 30-35 min, until the phyllo is nicely browned and crisp. 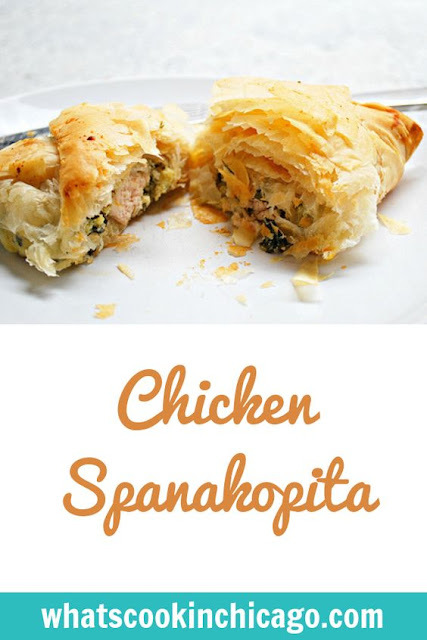 With the addition of chicken I could definitely make a meal out of spanakopita!